Update on June 26th: We've sent a response to the signatories of the letter. You can read it here. A recent surge in compromised web servers has generated many interesting discussions in online forums and blogs. We thought we would join the conversation by sharing what we found to be the most popular malware sites in the last two months. As we've discussed previously, we constantly scan our index for potentially dangerous sites. Our automated systems found more than 4,000 different sites that appeared to be set up for distributing malware by massively compromising popular web sites. 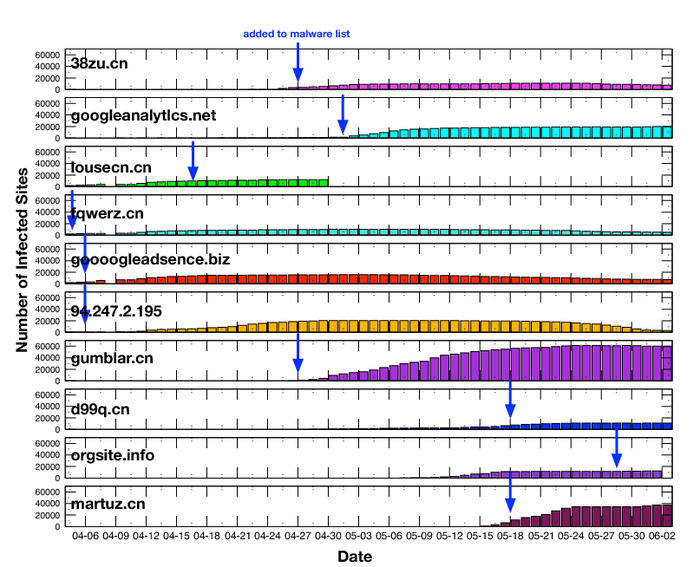 Of these domains more than 1,400 were hosted in the .cn TLD. Several contained plays on the name of Google such as goooogleadsence.biz, etc. The graph shows the top-10 malware sites as counted by the number of compromised web sites that referenced it. All domains on the top-10 list are suspected to have compromised more than 10,000 web sites on the Internet. The graph also contains arrows indicating when these domains where first listed via the Safe Browsing API and flagged in our search results as potentially dangerous. Other malware researchers reported widespread compromises pointing to the domains gumblar.cn and martuz.cn, both of which made it on our top-10 list. 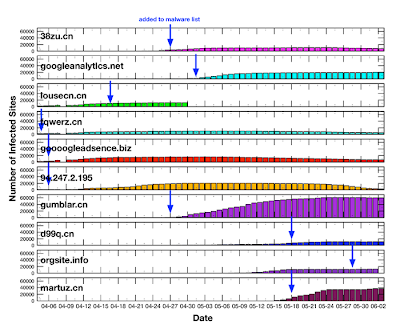 For gumblar, we saw about 60,000 compromised sites; Martuz peaked at slightly over 35,000 sites. Beladen.net was also reported to be part of a mass compromise, but made it only to position 124 on the list with about 3,500 compromised sites. To help make the Internet a safer place, our Safe Browsing API is freely available and is being used by browsers such as Firefox and Chrome to protect users on the web.